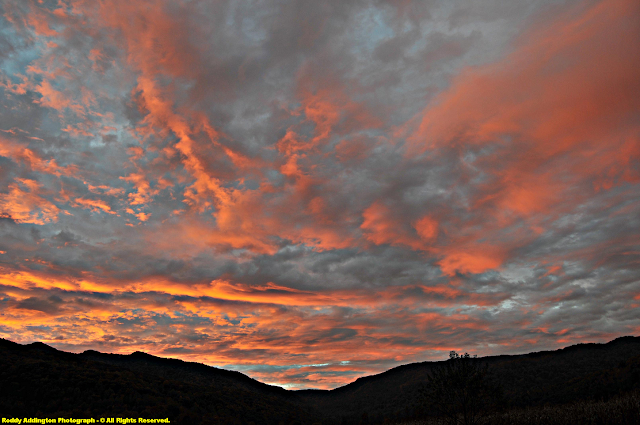 A fiery sky set the heavens aglow early Friday, October 23, as the sun began rising above the rugged eastern horizon of the great High Knob Massif, marking precious moments in time that were to be savored, treasured, and recorded by the gifted photography of Roddy Addington. this magical scene was pure inspiration! Generated by a mixture of water vapor, ice, light, and invisible currents of rushing air that were lifted by the High Knob Massif in low-levels, and a jet stream at high-levels, this setting was a truly soul touching event! 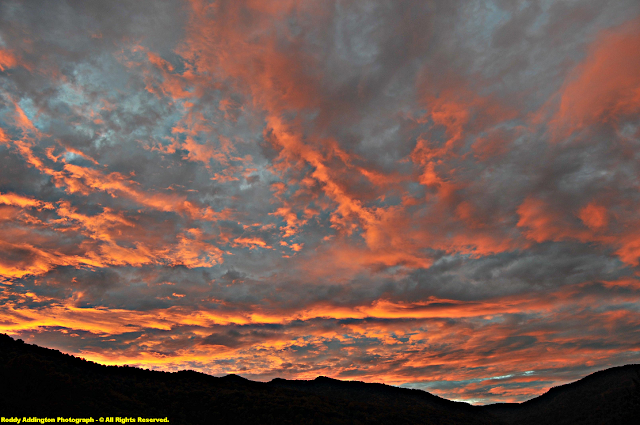 Winds within the lower atmosphere were strong out of the SSE and aligned almost perfectly to generate long, horizontal rows of orographic wave clouds, which seemingly became longer and more fiery outward from the head of the great South Fork Gorge. Embedded within these longer wave clouds were singular to multiple stacks of lenticular wave clouds, and various other forms of interest, as will be highlighted throughout this section and seen in every gorgeous photograph. [ Note a distinct lenticular cloud with a round, lens-shaped top and sun illuminated, curved bottom within the center of this next heavenly masterpiece. More examples of these cloud types will be shown in subsequent photographs. 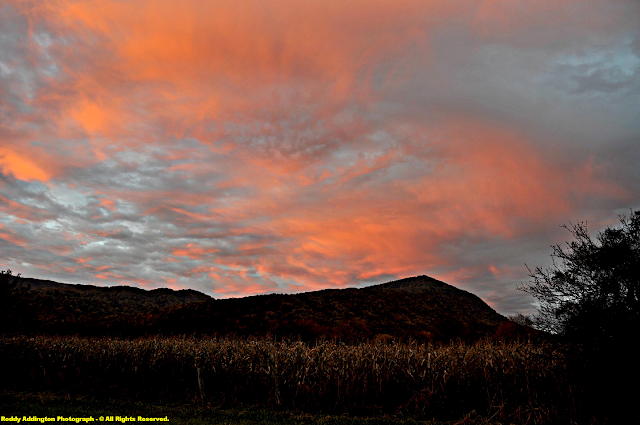 Stacked lenticular clouds are also displayed beautifully within the first scene of this section, above the Maple Gap to Morris Butte of Powell Mountain of the High Knob Massif, where they appear to be partially hidden by streams of virga. Precipitation falling and evaporating aloft, which would play an interesting role in Roddy's final photograph of this scenic series ]. This photograph by Roddy is the absolute epitome of mountain serenity with an imagination of families awakening to the dawning of a new day, amid a peaceful, pastoral valley set against a simply awesome backdrop of jagged cliffs whose rugged presence stand like guards at the edge of a great, sprawling mass of highcountry spreading outward for miles beyond the open, green meadows and cornfields to which it towers above! 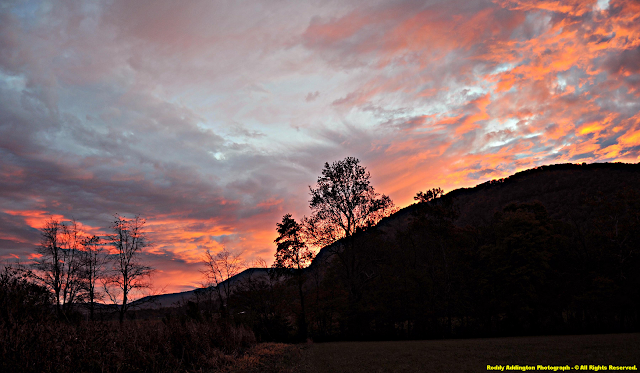 [ In this case a true description of the High Knob Massif, the remnant highcountry of the High Knob Landform ( HKL ). The High Knob Massif is the widest mountain from base-to-base in western Virginia, and one of the widest in all of the Appalachians. The mountain crestline rising upward along left side of the above photograph being dominated by jagged cliffs, which generate the undulations observed in its form. Part of an array of upward stair stepping mountain ridges forming South Fork Gorge. 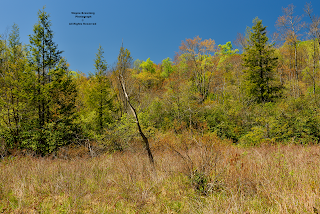 The High Knob Landform ( Introduction ) ]. and way to begin a new day! Numerous lines of orographically generated wave clouds can be seen emanating outward from the lofty mountain gap visible near center of this scene, high in upper reaches of South Fork Gorge, as air currents rushing across the majestic High Knob Massif are forced to ripple like great ocean waves amid the fluid atmosphere. [ The lens-shaped lenticular cloud previously noted being an example of a mountain wave that is holding nearly stationary ( as will be illustrated below near the Grindstone Ridge Dome ). It is harder to initially see, since so many other wave-form clouds and cloud fragments are present in the atmosphere ]. Other wave clouds, possessing notable variations in the direction of their axes, can be seen as up and down, or undulating, currents of air pass across the High Knob highcountry and reach upward toward a more SW-NE oriented jet stream of turbulent air. Once again, as seems so often the case amid this great mountain landform, peaceful serenity hides a clash of dynamic forces! Roddy's gift in capturing pictures is beautifully displayed above, as a host of dynamic forces work together to generate this magnificent display! 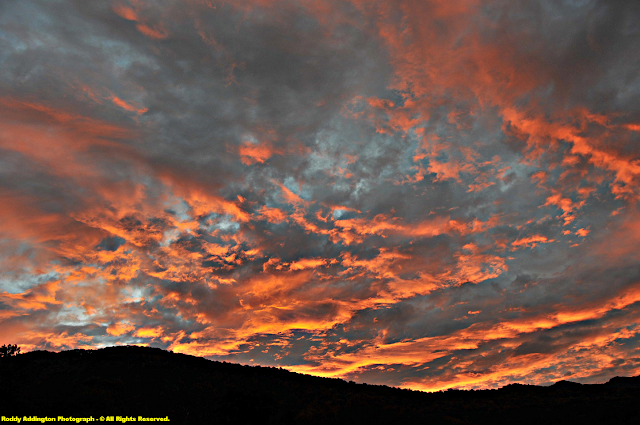 Bases of the lowest wave clouds are literally on fire, illuminated by the rising sun, to reveal mini-waves, rolls, and ripples which are embedded within the larger-scale waves. Time lapse video photography of the above would further reveal that the longest wave clouds which Roddy captured in nearly every image are essentially stationary, or standing, orographic waves with sections trending toward lenticularis and stacked wave forms ( as highlighted below ). Stacked wave clouds are visible in the above photograph adjacent to the great Grindstone Ridge Dome of the High Knob Massif. 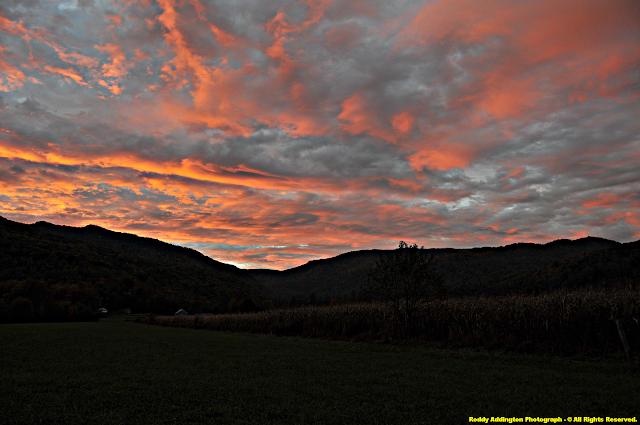 Some of the most numerous can be seen left of Beaverdam Gap, and the convex Grindstone Dome ( where the rising sun has the horizon GLOWING with incredible brightness ), with numerous pinkish wave clouds stacked atop each other. Simply INCREDIBLE! Less visible, and not fully illuminated by the sun, is a distinct lens-shaped cloud which is grayish in color, just beneath those pinkish stacks of clouds. This is a mountain generated wave cloud which has formed lower to the summits. 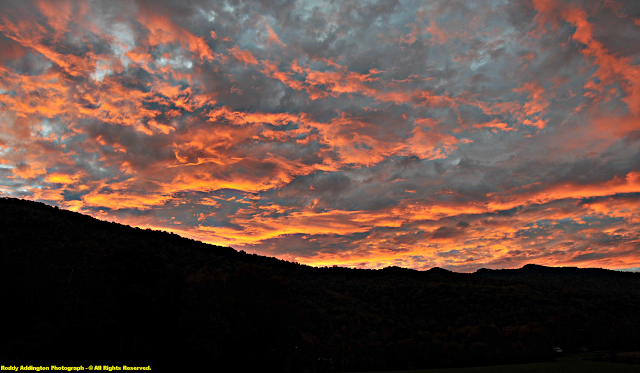 [ The High Knob Massif is one of the most prolific generators of orographic cloud forms in the southern Appalachians, with a unique ability to develop wave form clouds on essentially every direction of the compass. This is related to its atypically wide base-to-base widths, and good exposure, which act to perturb flow fields and dramatically impact climatic conditions ]. The Grindstone Dome plunges 2000 vertical feet within only 0.8 air mile, to represent one of the greatest short distance elevation changes across the entire western expanse of the Appalachians. It's 3821 foot summit stands 402 vertical feet lower than the peak of High Knob, and can actually be looked down upon from the open expanse of High Knob Meadow. It dominates the view from scenic Powell Valley Overlook, along U.S. 23, and often is a forcing zone for multiple, stacked cloud layers ( especially on SW air flows which must funnel upward through the Valley Head ). I could teach a meteorology class, or perhaps even an entire course, on this wonderful set of photographic scenes, since every gorgeous picture by Roddy offers a multitude of unique cloud forms shaped and sculptured in multi-dimensions. The entire setting being forced by a dramatically diverse mountain landform and its interactions with dynamic jet streams of rushing air ( at both lower & upper levels in the atmosphere ). How could precious moments in time, such as these so beautifully captured by Roddy on this morning amid the open, calcareous heart of the great High Knob Landform come to an ultimate conclusion? 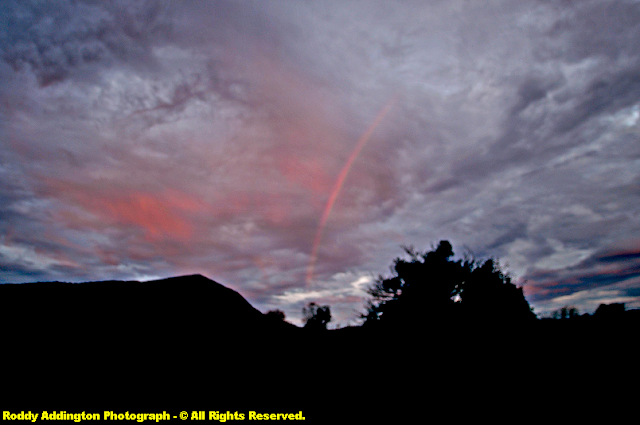 With a sunrise BOW adjacent to the plunging northwest slope of Powell Mountain.